It’s time for my weekend competition and today’s featured publication, written (and illustrated) by highly experienced musician Nancy Litten and published by Alfred Music, focuses on the numerous permutations of choir and singer warm-ups. Choral and Vocal Warm-ups provides invaluable information for pianists regarding every aspect of warming-up with a step-by-step guide through the different stages, as well as plenty of useful accompaniments. There is also advice about practising various common harmonic progressions, so pianists can confidently assist choirs in every situation. 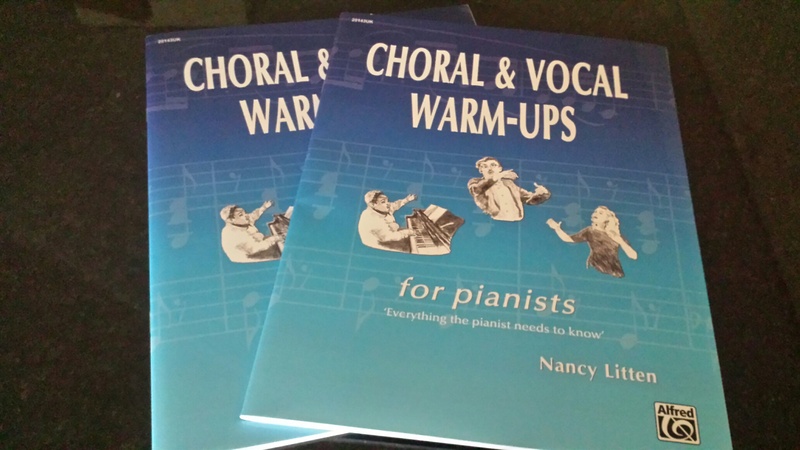 Beneficial for pianists and choral directors, I have two copies of Choral and Vocal Warm-Ups to giveaway, so please leave your comment in the comment box at the end of this post, and I will announce the two winners on Sunday evening (British time). If you would like to purchase Choral and Vocal Warm-Ups, click here. It seems useful and interesting!! I would like to win it!! Ohhh! I would love one of these! I really would like to have it,i hope i ll be lucky!! Looks like a valuable resource for choral accompanists – I’d be very interested to read it. I struggle to keep fresh ideas flowing for our warm ups. This resource looks fantastic, it would make my day to win! Oooh! This looks great! I’ve played for choirs in the public school for years and filled in for maternity leaves for choir teachers. Thanks for the giveaway! I have three choirs that would benefit. Thanks for offering. If I don’t win, I’ll probably purchase a copy. I’d love to win this! It looks like a brilliant resource. Thanks for offering the opportunity. It would be a good resource to have. Thanks! As a choral accompanist, I can vouch for the need for such a book. On the occasions when I have to warm up the choir, I have a hard time remembering some of the warmups, since the director usually plays them. I have recently begun work as a choral accompanist, and this book would be so helpful to me as I learn the ropes of working with singers! This would be a great addition to my teaching. This would be great to have since I’m working with an elementary choir and my accompanist is not familiar with warmups. I am going to be student teaching next semester and this is very useful resource to start getting ready to lead choir for the warm up. Looks like a marvelous resource for pianists and choral condcutors alike. This would be perfect for me. I have a few voice students and am always looking for interesting material for them. Well finally! So glad this topic/book is out there now. So useful. I do wish to win because otherwise it will have to go down my wish list a ways lol, as I am mainly a pianist ….. But it would be so useful in convincing my church group to warm up with me. Thanks for the review as always Melanie. Sure would love this!! I’m a choir director and have several voice students that would certainly benefit. This would be a wonderful resource for my choir warmups! This does seem like a very useful book! Thanks for holding the give-away. I would love to have this book!! This would be a great resource for my students! This looks like a very useful resource to use with my choir! This looks like a very useful resource! Wow…this will be the most special gift to arrive via post to a beautiful Cape Town, South Africa at the bottom tip of the African continent….Oh, I hope this will soon be in my post box! What a good idea to offer something that’s not specifically for the piano. So many students clam up when you ask them to use their voices for aural work. I try to incorporate some singing into as many lessons as I can, to overcome this shyness, and also to encourage an understanding of other aspects of music development, plus, I love to sing anyway! I also sing with an a capella chorus, so any ideas for new warm ups would be warmly received. Thanks Melanie, great competitions, and really interesting articles on your blog. Sounds very useful. Thanks for the opportunity. A completely new idea to me! Wow!! Something new for my students! Always looking for new vocal warm ups for my choir! Sounds like a great resource. This looks really useful. I sub for children and adult choirs – would love to see if material is suitable for both! I’d love to check out one of these! I would love this resource. It would be very useful for helping my piano pupils to develop musicianship skills through an aural-vocal approach as well as to understand that instruments like piano can be seen as an extension of our ability as humans to sing. Thanks. this looks right up my alley. I’m always looking for new material like this! Melanie, you are such a fount of knowledge and resources! Thank you for sharing these with us! As with a couple of the other entrants, I, too, am new to choral accompanying and think this would be a super resource to have should it fall on my shoulders to warm up the choir. I also like the fact that the description mentions “… advice about practising…progressions, so pianists can confidently assist choirs in every situation.” Anything to bolster my skills and confidence would be a wonderful addition to my library! Although I am not a consistent entrant into your competitions, I am very grateful that you offer them. Thank you for these possibilities!